The Legend of Zelda: A Link to the Past and Ocarina of Time just celebrated their 27th and 20th anniversaries respectively on Nov. 21. The two games have continued to be loved by players since their release, traveling from new console to new console, with updates and improvements in design and graphics. As technology advances, it continues to pull A Link to the Past and Ocarina of Time along, to either entice new players or stoke the nostalgia of those already familiar with the games. Recently, however, the most interesting innovations to these two games have not come from Nintendo, but from its players, specifically the hackers who are rewriting the very fabric of the originals. They’re moving items around, changing dialogue, and randomizing the entire Zelda experience. A randomizer is what it sounds like: a tool that randomly shuffles the information you put into it. Outside of videogames, randomizers have been helpful for jumbling numbers, lists, names, or anything that needs to be changed by chance. Many gambling games like blackjack or the lottery have relied on generating numbers in order to create games based off luck. For the Zelda series, randomizers do more than scramble numbers. They shuffle items, like bombs, the ocarina, or even the legendary master sword. There’s no one type of randomizer; there are categories for what is shuffled or simply removed from the game, depending on player preference. For example, a swordless mode removes the sword from A Link to The Past, and songsanity remixes the location of the songs in Ocarina of Time. Whole cutscenes can be removed, and new text can be added. Because of ROM hacking, people have worked hard to make Zelda no longer predictable, let alone linear. Games are constantly being chopped and twisted because of ROMs. Kaizo Mario World, developed by T. Takemoto, was a popular series of hacks that greatly increased the difficulty in Super Mario World. Invisible blocks, near-impossible jumps, and traps were extremely common in the game, and its trickiness made it intriguing for players who grew up playing the original games. Like Zelda, Mario is a staple in gaming history. Its popularity and familiarity makes it incredibly alluring to jumble. The Legend of Zelda isn’t the only series getting randomized. And while older titles like Mega Man or Metroid are excellent fodder for shuffling, newer games like Dark Souls and Skyrim have also been reshaped into this new form. Still, the Zelda series seems to be the most popular games to bend and break. What makes a Zelda game so fun to break? Why is it so interesting to find the ice rod or a heart piece in an area it definitely should not be? When asked about other games, Laso noted that the important thing about a randomizer is its possibilities. For example, a Mega Man game has few things to change, so replayability is low compared to other games. However, the first game to be randomized, Pokémon, is full of aspects that can be tinkered with and changed. “Randomizing little things like Pokémon to going crazy and changing types and moves is always entertaining,” Laso explains. Randomizers are considered new opportunities to breathe life into games that can be decades old, but they do more than resuscitate games. They create entirely new ones. Sure, a randomizer may look the same as the original game, but does that mean it still is the original? If Link saves Hyrule and defeats Ganon without his sword, is it still a Zelda game? What happens to Ocarina of Time if Ganon’s tower is open from the very beginning, or if some medallions are never obtained? The randomizer community may have seen itself as just another way to give old games a new twist, but what it’s also done is introduce a longstanding tradition from other artforms into videogames. Using established work to create a new one is not new in art. In visual works, found art is when an artist modifies an object to turn it into an art piece. This could be an ordinary item, like adding spikes to an iron, or an irreverent new take on a classic piece of art, like giving the Mona Lisa a mustache. And remixes have been a standard part of the music industry for decades. The point is to give an already established object an entirely new meaning and context with a few crucial changes. Randomizers do exactly this to the games they alter. The difference is that their modifications aren’t necessarily done by human hands, but by the luck provided from a computer. Yet, even this isn’t new to art, as Aleatoricism is an artform that uses chance to create art. In Latin, alea means “gambling” or “rolling the dice,” and in this case, it’s digitized dice that are creating the game. The randomizer then becomes a collaboration between human and computer, player and creator. The player decides on whether to do a swordless run, or whether to change the color of Link’s tunic. These choices, whether large or small, help create personalized art that can only be made when the digital and physical coincide. 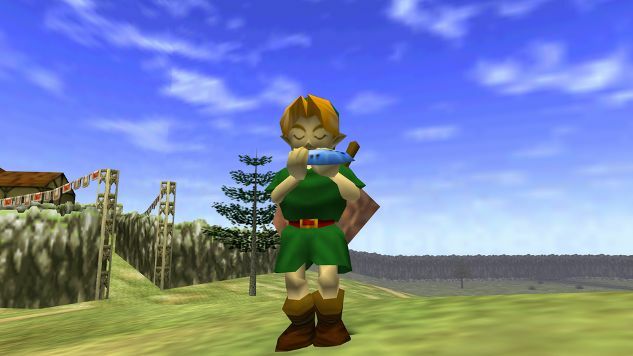 Once one major item is moved, Ocarina of Time is not Ocarina of Time anymore. Its original objective breaks, and in that disruption something wildly exciting blooms. In the years since their original release, Ocarina of Time and A Link to the Past have both been completely reinvented. Their goals are no longer to obtain the master sword, to save Zelda, or even to save Hyrule. Now both games move like mazes with innumerable dead ends. There’s no Navi to tell you where to go next, no sword sleeping in its pedestal. After over two decades with these games, players have found new stories to tell and new art to experience, thanks to some innovative hacking and powerful computers. Randomizers show the new ways in which computers can help reinvent games and art, blurring whatever lines might exist between the two. And the players who create them do so out of love for these games, a love strong enough to breath new life into the past.